This dish just screams fall. I received an acorn squash in my veggie share basket and couldn't wait to try this recipe from eatingwell magazine. It does take a little while to make (some chopping veggies etc) but if you have a little bit of time, this healthy, flavourful meal is definitely worth it. The squash would also be good on its own. To prepare squash: Halve squash through the stem end; scoop out seeds. Place cut-side up on a rimmed baking sheet. If necessary, cut a small slice off the bottom of each half so it rests flat. Combine melted butter, honey, garam masala and 1/4 teaspoon salt in a small bowl; brush all over the cut sides of the squash. Bake the squash for 10 minutes. Brush again to redistribute the butter. Continue to bake until the squash is tender, 30 to 35 minutes more. To test if it’s done, sample a little bit of the inside—it should be tender. 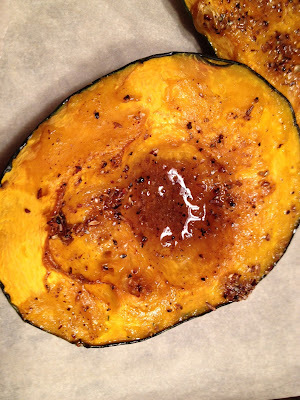 Turn off the oven, tent the squash with foil and leave in the oven to keep warm. To prepare lentils: Bring water, lentils and 1/8 teaspoon salt to a boil in a medium saucepan. Adjust heat so the water is lightly boiling and cook until the lentils are not hard, but still maintain their shape, about 7 minutes. Drain, saving any lentil-cooking liquid; set lentils and liquid aside. Heat a medium skillet over medium heat. Add 2 tablespoons butter and cumin seeds and cook, stirring, until fragrant, 1 to 2 minutes. Stir in leeks, carrots, shallots, ginger and 1/8 teaspoon salt. Cover and cook, stirring occasionally, until the carrots begin to soften, about 10 minutes. Stir in jalapeños, coriander and turmeric and cook, stirring, 1 minute more. Stir in tomatoes and 1 cup of the reserved cooking liquid (if there isn’t enough, make up the difference with water). Bring to a simmer, stirring occasionally, then cook for 5 minutes. Stir in the reserved lentils and simmer until they are soft and tender but not falling apart, 3 to 5 minutes. If the mixture seems dry, add more cooking liquid (or water). Stir in roasted peppers. Season with the remaining 1/2 teaspoon salt and pepper. Divide the lentil stuffing among the squash (a generous 1 cup per half). Serve garnished with a dollop of yogurt.